Those of you who faintly recognise the above words from John Masefield’s Cargoes poem, will probably be extremely interested to hear Maggy Simms talk on Ancient Iraq – The Land Between the Two Rivers. We are very pleased to welcome her back after she who thrilled us in 2016 with her talk on the Minoans and Myceneans and its comparisons to present conditions in the west. Some 5000 years ago wealthy cities emerged in Mesopotamia, the land between the rivers Euphrates and Tigris. In this talk Maggy will explore this ancient landscape and its people, its treasures and the legacy it left to the modern world. The Garden of Eden, the Great Flood and the birthplace of Abraham figure among legends that originated here, and its cities such as Babylon enjoyed unparalleled wealth and sophistication. Maggy’s talk will encompass the Ziggarats that probably inspired biblical story of The Tower of Babel. These buildings were a testament to the power, culture and skills of these ancient people and it is thought that they were built principally by the Sumerians, Akkadians and Babylonians not for public worship but to make the temples closer to heaven and therefore to God One of the largest and best-preserved ziggurats of Mesopotamia is the great Ziggurat at Ur. Some of the truly fabulous artefacts found at Ur can be seen in the British Museum and are demonstrated on this page. They were found in the Great Pit in the Royal Cemetery. The ‘Queens” lyre is beautifully decorated with lapis lazuli and a bulls head. Leonard Woolley who uncovered the artefacts and skeletal remains apparently stated that the scene was as if “the last player had her arm over her harp, certainly she played to the end”. The gorgeous Ram in a Thicket, one of a pair, thought to be table stands, was another stunning find. As was the Royal Standard, made of ivory and lapiz lazuli. Royal Standard of Ur. Made with ivory and lapis lazuli. 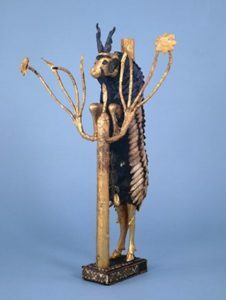 Modern reconstruction and preservation of one of the lyres pays testament to the will and commitment of people, some in war torn areas, to preserve aspects of their ancient past. 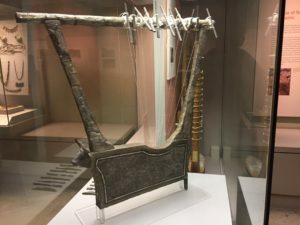 See http://celticharpblog.com/lyre-of-ur/ or Wikipedia for more gorgeous images. So come along and dig deeper into the ancient past of Mesopotamia in our first lecture of the 2018/19 season. And Masefield’s fabled quinquereme – “Rowing home to haven from sunny Palestine.. with its cargo of ivory, apes, peacocks, Sandalwood, cedarwood and sweet white wine.” – it seems to hark back to this distant era. This poem was certainly sung in one church school in the 50’s in the local area. Sadly, Nineveh’s importance as one of the world’s largest and greatest cities is lost in antiquity and it is now a ramshackle province in the midst of Mosul, its architecture and treasures further destroyed and desecrated by military action. And this is what is said “Every ancient writer mentions Babylon with a tone of awe and reverence”.